Working on launching a product? Have a website or app that's coming soon? If so, you're probably no stranger to "coming soon" pages. Coming soon pages can help build excitement around your brand prior to your launch. They can help keep your domain branded while at the same time helping to generate a targeted list of early adopters interested in your product. But just like any landing page, pre-launch (or coming soon) pages need to be optimized for conversion in order to have the best results. 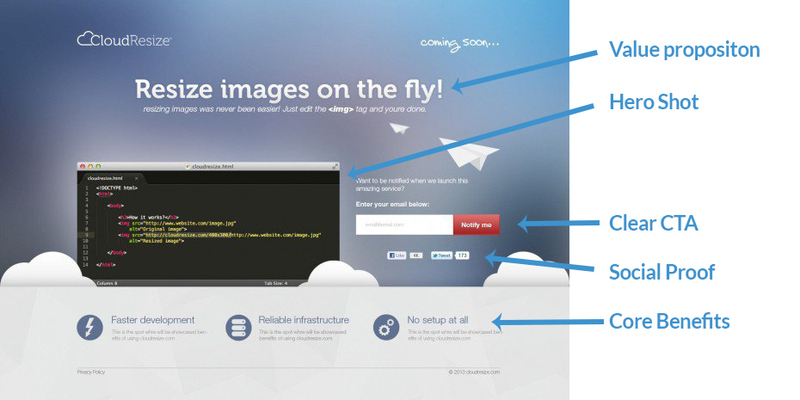 Here's an example of a well-optimized coming soon page from CloudResize that has all of these elements. But once you've done your standard conversion rate optimization for your coming soon page, you might be left wondering "OK, so how can I get even more out of my coming soon page?" That's what this article will get into. We've compiled 25 clever coming soon page examples to help increase your number of pre-launch conversions, and get better insights about what your customers want. And the beauty of the tactics outlined in this article is that once you have a well optimized coming soon page up and running, they take little to no time to implement. With our roots in social promotions, Wishpond is no stranger to the value that sweepstakes and contests can bring from a conversion and user engagement perspective. But one little known trick is to combine a sweepstakes with a coming soon page. Utilizing a coming soon page with a sweepstakes is a great way of increasing the overall incentive of your pre-launch page and can help increase the number of participants and users that will convert on your landing page. As humans, we're naturally drawn towards things that are exclusive and scarce. That's why products made in limited numbers are more likely to sell out. It's the same reason why limited time offers perform so well. Another way of creating scarcity is by framing your coming soon page CTA as "Request an Invite" rather than simply "Joining". Reframing your coming soon page with this type of exclusivity built in is a good tactic in increasing the perceived value of your product prior to its launch. Referral promotions naturally have an element of virality built in to them. That's because when users are rewarded for sharing, and those that they share with are rewarded for sharing - the number of people which you can reach expands exponentially. Try adding a referral element to a coming soon page to amplify the number of people you can reach. 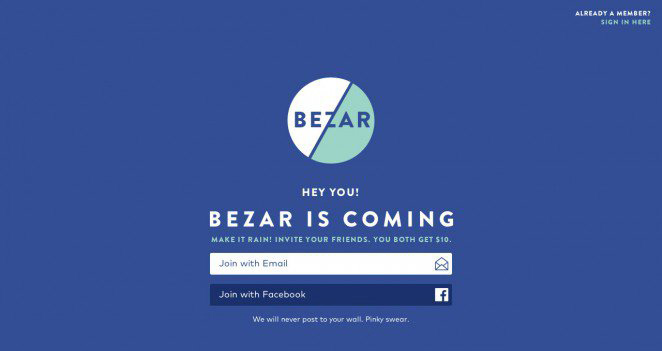 Take a look at this example from Bezar where they offered a $10 credit to any users (and their friends) when they referred someone else in their network. Using this strategy is a great way to build up excitement around your brand using a viral coming soon page. Nothing increases urgency and conversions like adding a countdown timer. Used on a coming soon page, you can incentivize people to sign up by offering them a special offer only available in the pre-launch period. This could be anything from a discount, exclusive content, in app features, community access, etc. The important thing to know is that while countdown clocks are effective, they are only effective if the clock is counting down to something. Take a look at this example where the countdown clock is counting down to when users will lose access to a special in app perk. 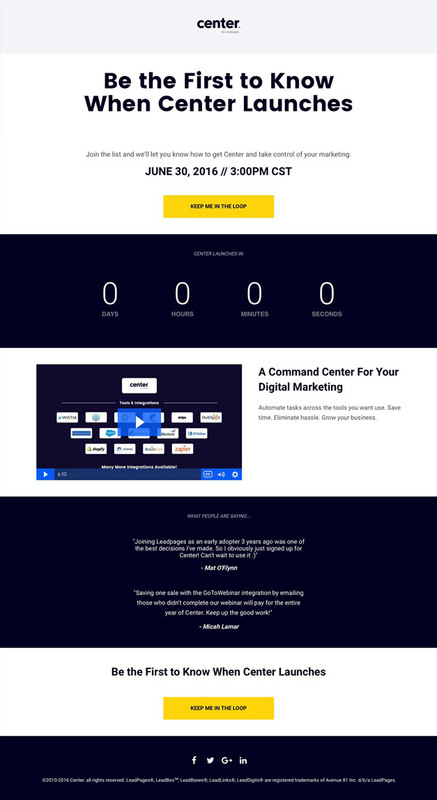 Combined with an offer, a countdown clock like this can help put some pressure on your users and increase the number of people converting on your pre-launch landing page. If you're even thinking about putting up a coming soon page, it's likely because whatever it is that you're offering isn't quite finished yet. If this is the case, try using a survey from companies like Qualaroo and Hotjar in order to collect information about what features are important to your users before the products been released. You can then take this information back to your development team and make adjustments according to how your users respond. Adding this simple survey box can be a good first step in generating feedback about what people actually want, in order to prevent developing a product that doesn't stick. A coming soon page is great, but you won’t be able to generate leads effectively if your potential customers don’t know what to expect. Range does a great job answering the question: what am I waiting for? by clearly pointing out what solutions their product provides. They do this by adding a bullet-point list to the bottom of the page, directly addressing what Range can do for its users. It can be tough to put together a cohesive coming soon page without a finished product, but you should at least know what your product is built to achieve - sharing this with your customers can increase confidence, reduce uneasiness, and help you generate additional leads. This is an awesome coming soon page example. Besides the stunning design and layout, there are a ton of great things on this page that you can put to use on your own coming soon landing page. First, I love that they highlight features with screenshots. Obviously, this is a product that’s almost ready for launch; being able to show users exactly what they can expect from a feature standpoint is great to get people interested. Next, I love the “Try Webflow for free” CTA. It’s action-oriented and low-commitment, because potential customers can try the product without paying. The alternate “Be one of the first to try it” section serves the same purpose with slightly different messaging, which helps to get people who may not have been sold on the other CTAs - putting a form right in this section makes it easy for people to convert. 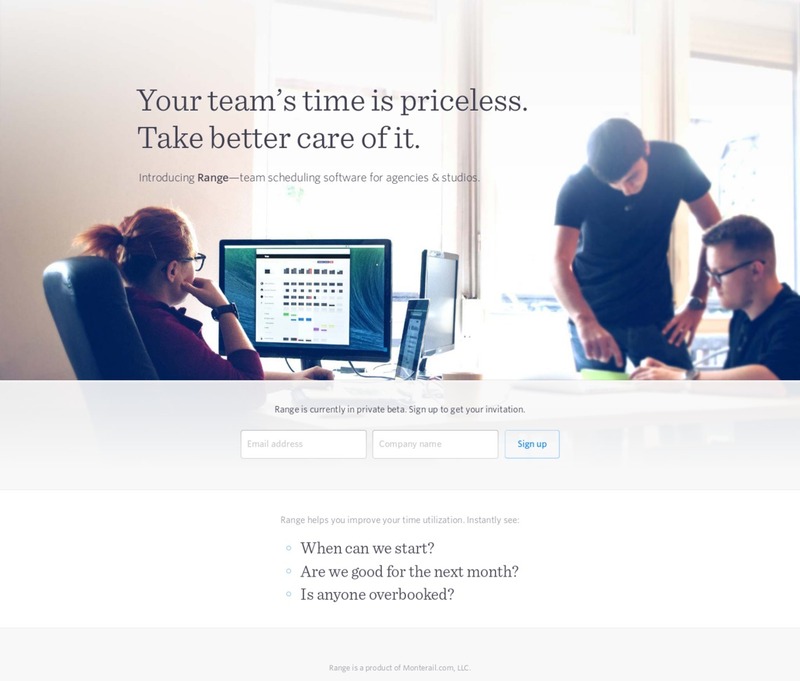 This coming soon landing page is great because it tells a story. It takes a common problem - lack of time to exercise - and lays it out bare in front of the reader. Zova’s coming soon landing page builds up this problem and dismisses other solutions that usually don’t work for page visitors. Then it presents a solution, making it sound as enticing as possible to keep readers interested. Though this landing page is actually quite vague when it comes to describing Zova itself, the story it tells gets readers invested in the idea of Zova, helping the app generate leads for when it does launch. This is one of the best coming soon landing pages for a multitude of reasons. First, the headline is enticing - who doesn’t want to be the first to know about the latest product? The CTA is bold, contrasting, and action-oriented, literally telling potential leads that they’ll be “in the loop” if they click. As always, I love the countdown timer because it creates urgency in viewers and does a great job in getting them to act immediately in fear of missing out on the offer. The video below reduces uncertainty by giving page visitors a better idea of the product, and the testimonials below help increase conversions by introducing social proof. Overall, this is a great coming soon page example. Though this isn’t the best coming soon landing page, there are a few things you can take away from it to make your coming soon page great. In terms of the page itself, it’s mediocre - it’s not very specific, which doesn’t help to generate interest with page visitors. 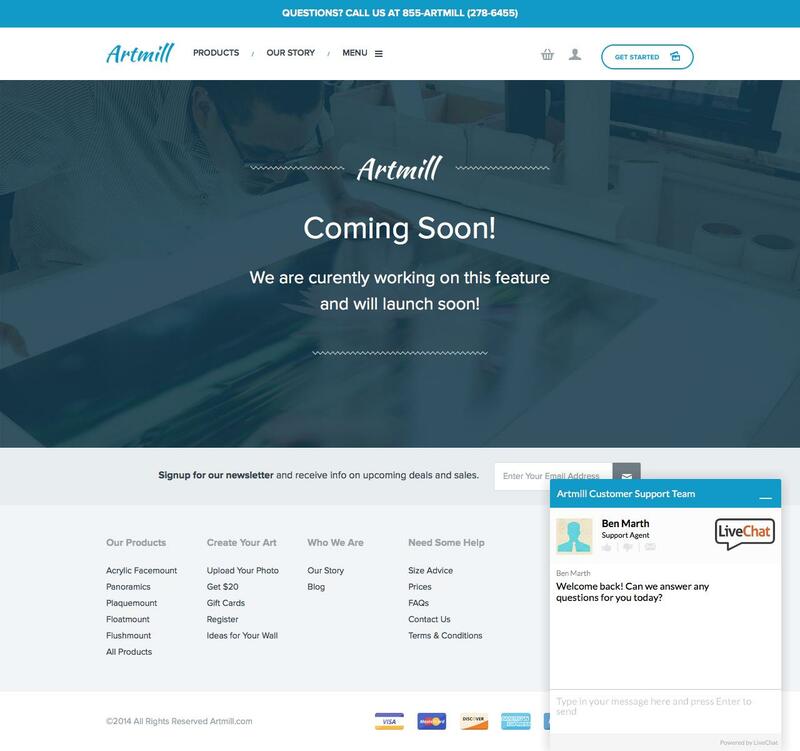 However, Artmill makes it very easy for customers to learn more. They have a “hello bar” at the top of the page with their phone number, inviting customers to ask questions, and an automatic chat that pops up at the bottom of the page in case people have any quick inquiries. They also invite users to sign up for their newsletter to receive more information, which is another way to generate leads. Keep it simple - that’s a rule we’ve heard all our lives, but it’s followed only seldomly. This page is great because its design is dictated by the size of the offer. 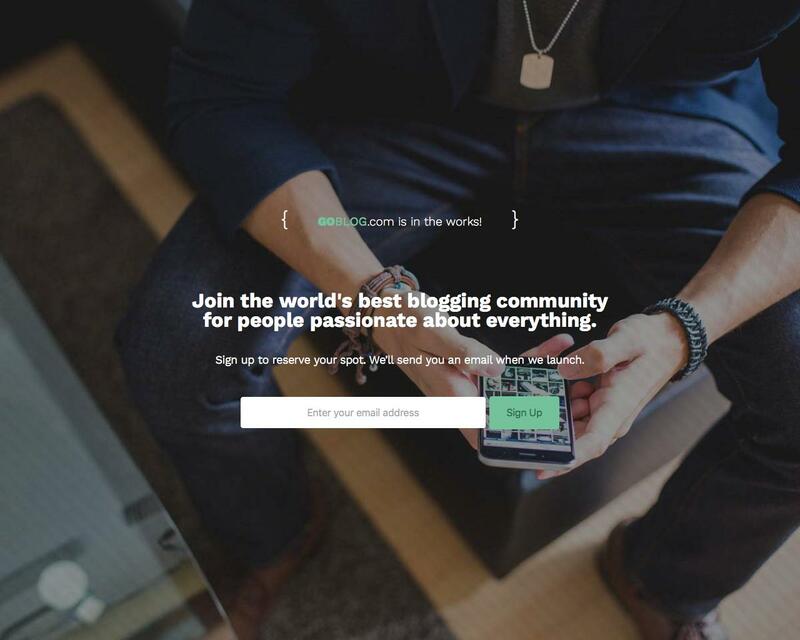 It’s not an expensive product or subscription service - it’s a simple blogging platform. This page doesn’t overwhelm its visitors, instead opting to stick to a one-line value proposition that does a great job explaining what the product is. This page is no B.S. - it tells you exactly what you’re getting into by putting in your email, and then allows you to put your email in immediately. I like that their form is directly on the page and that it only has one field. If you’re simply trying to get people to sign up for your (presumably free) blogging platform, a form with multiple fields probably won’t convert well. This is a great, simple coming soon page example. The first thing you’ll notice about this coming soon landing page is that it’s really, really, simple - the whole page lies above the fold. It’s hard to tell from the screenshot, but this page is actually very engaging. 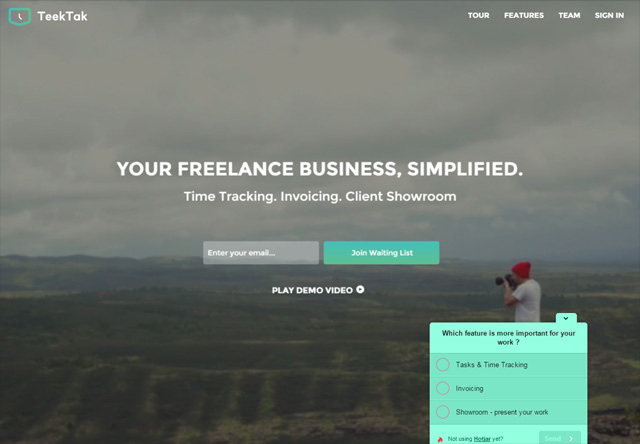 The headline (and accompanying subheadline) is clear and concise - it’s targeted towards business owners who don’t want to spend time or money designing a website for their product. The CTA button is great as well - it stands out well on a dark page, and it’s a gradient, which is eye-catching. The real star of this page, however, is the large video on the right. It’s not just a product overview - it’s a full-fledged demo that shows a visitor how they can easily create a page from scratch for their product. Pictures are worth a thousand words, and demo videos are worth millions - almost no amount of copy can convince a potential of the benefits of your product as well as a product demonstration can. This coming soon landing page is creative, but also very targeted in its objectives. The doodles (sketches? drawings?) at the top are cute, but the copy accompanying them is what really matters. It presents three common problems small business owners might face, which instantly makes the page relatable. The page then presents the solution to these common problems: WorkWeek. The next section presents the product’s value proposition, along with several examples of businesses that may be able to benefit from WorkWeek. The final section of this coming soon landing page is pretty good - it only asks for email address, and also features an “Industry” dropdown so WorkWeek can gain more information about the intent of its users. 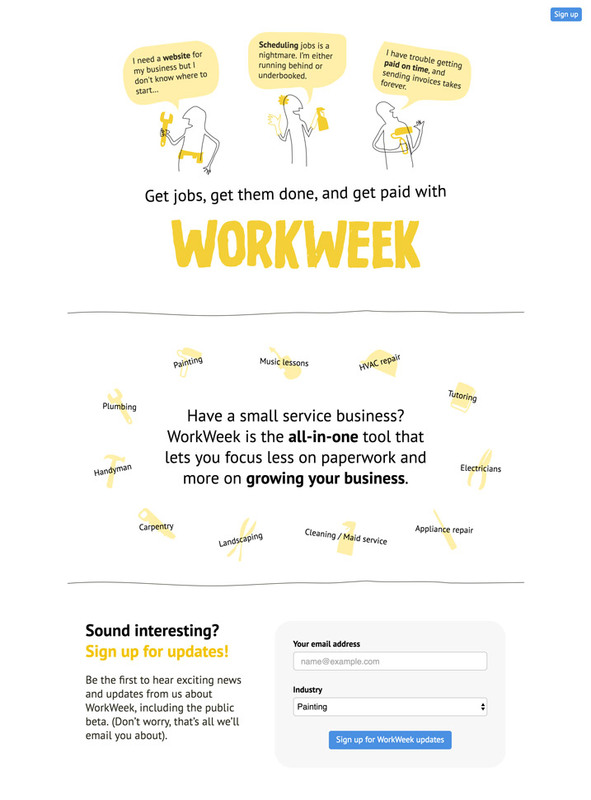 One thing I’d add to this page is a CTA at the top under the giant “WorkWeek” logo that brings users down to the form - this page might lose conversions because the form lies below the fold. 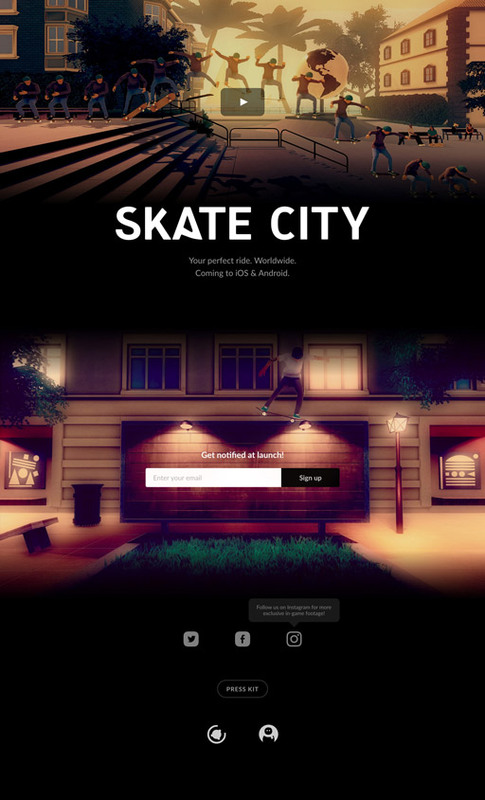 This coming soon landing page was built to promote Skate City, an upcoming game for mobile devices. The first thing you’ll notice is a near-full-screen video that populates the entire above-the-fold section. It’s simple and engaging, and tells just enough that it makes the viewer want to scroll down. The lower section of the page features two lights that animate briefly, illuminating the CTA to sign up for launch notifications. This subtle directional cue, combined with the animation, draw viewers’ attention directly to the main conversion goal on this coming soon page example. Finally, the social buttons at the bottom help to direct interested traffic to other platforms for updates. Right off the bat, this coming soon landing page catches visitors’ attention with its exciting layout and bright, bold colors. I like that the first piece of copy (besides the conference date) is a set of questions meant to engage the viewer - who doesn’t want to stay ahead of new technologies? Because the conference isn’t quite fleshed out yet, the page is quite vague; however, it still does a great job explaining what it’s all about and who can benefit from it. The conversion goal of this coming soon page example is simple - sign people up the their newsletter. Because their goal is to have a list of emails to market to once they have developed the conference further, it makes sense just to ask for visitors’ email addresses. I would’ve liked an action-oriented CTA like “Give me updates!”, but really, I’m nitpicking. Linking to social platforms is also an awesome way to keep potential conference guests engaged before the event. This screenshot really doesn’t do this coming soon landing page justice. As you scroll, the icons in each section blend into each other to create a visual experience that aims to describe what Gallery can do as a product - you almost can’t tell that these really act as screenshot placeholders as the product is being built. The copy is crisp and clear, simply describing what a Gallery user can achieve with the app. There’s a subtle directional cue (a small yellow button with an arrow) that floats on the bottom right of the window, guiding users to the next section of the page. The only CTAs on the page are at the very top and very bottom - I wouldn’t have minded a CTA in each section, especially considering the CTA style is simply text. From a design perspective, however, this page is awesome. This is one of my favorite coming soon landing pages. 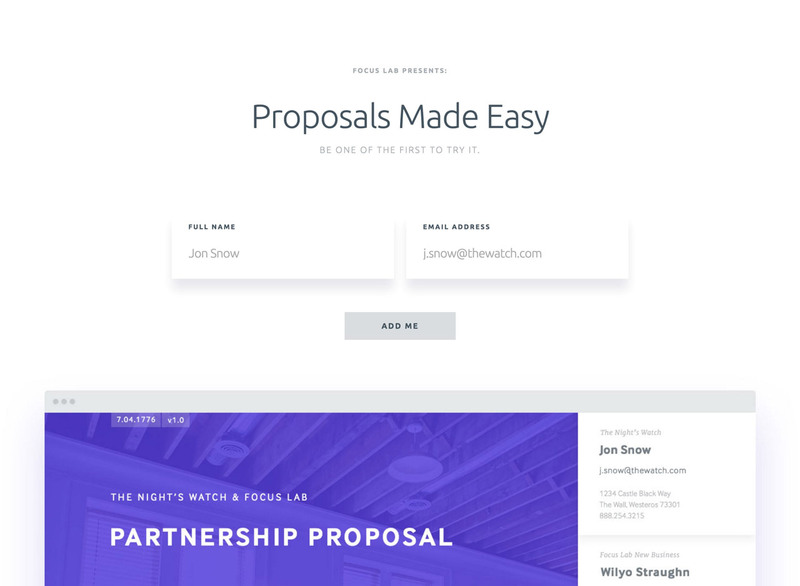 The product name (Proposals) is simple and sits right in the headline, which clearly describes what it does and the benefit it offers. The subheadline suggests exclusivity, which can help to increase interest and drive conversions. I like that the conversion goal (the form) is clearly emphasized on this page through its size and the giant drop shadow beneath it. This serves to really lift the form off the page and make it clear to viewers what they need to do on this page. The bottom portion previews what a finished product might look like - I dig the cheeky Game of Thrones reference, too. From a UX perspective, it’s a little frustrating not to be able to scroll down and see more - but that might actually just make visitors more interested, further increasing conversions. Either way, this is an expertly designed coming soon page example. This is a page that does an awesome job demonstrating the upcoming product (a collaborative prototyping software) for its visitors. Having a form at the top of the page (above the fold) is great, because it maximizes conversions from people who might not want to scroll further or read more. The “learn more” button has a bouncing mouse animation above it, which entices viewers into scrolling down and learning more about the product. 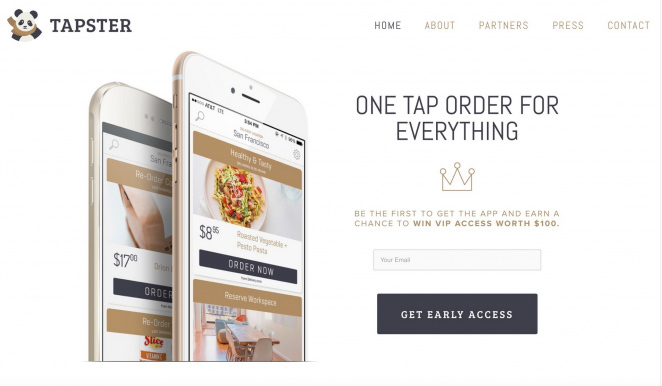 The “Prototype without coding” section is incredibly effective because it allows page visitors to see how the app might work once it’s launched. More than just a video, it’s a live demo that allows potential users to try a part of the product, which an exciting way to garner conversions. Finally, the bottom section of the page includes another form - this gives people who weren’t sure about converting at the top of the page another chance to get in on the action. 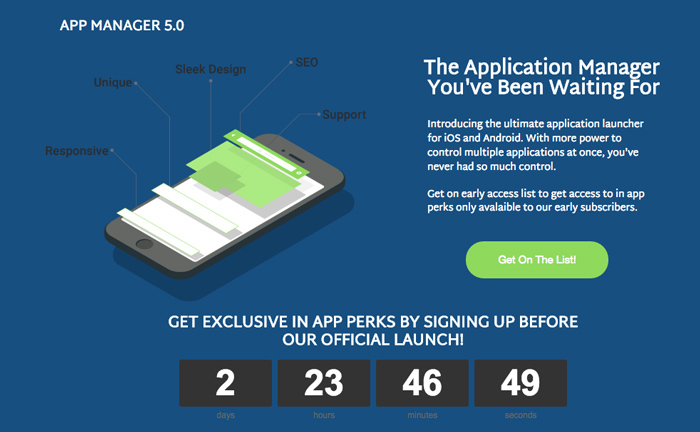 There’s a lot to cover on this coming soon landing page, so buckle up! First, I like the headline - it’s a clear statement of value about the product. The bold red CTA on the top-right of the page is attention-grabbing, as well. The image on the right is interactive - clicking the +s brings up small text boxes that explains the various features of the FreeWrite. Besides the beautiful animations as you scroll into each section, I like that the designer wasn’t afraid to add multiple CTAs to the page (even a subtle sideways “Buy” CTA in one of the sections). FreeWrite highlights their integrations in one section, which provides credibility and also reduces uncertainty through familiar logos. The bottom section features a quote from a reputable source (the Wall Street Journal), specifications, and an “Order Now” CTA, all of which are sure to increase conversion rates. This is a crispy, crispy coming soon page example. Type Nugget is a tool that helps designers generate typography for web - it’s a product with a very specific customer base, and you can see in the design of this page that they understand that. The headline is high-intent, explaining exactly what users can do with the tool; it’s followed by a directional cue with some cute copy (“Oh hot damn, tell me more”). I like that they highlight features over benefits here - designers don’t really need to be convinced of the benefits of beautiful type, they just want to know how they can achieve it. The page goes over the features that make Type Nugget an awesome tool for web typography - but I wouldn’t have minded if they added a CTA button under each feature. Finally, the page ends with two CTAs: a survey invite and a “keep me updated” email signup. I like having survey pages on coming soon landing pages; they show that as long as the product is in development, that the company is listening and willing to take in feedback to make the launch as successful as possible. This page is great for a product that’s quite a ways from launch. Though there probably isn’t much to say about the tool itself, the copy on the page highlights what Abstract’s goals are. It also invites visitors to follow the company on Twitter and sign up for the mailing list. The form is high up on the page, which maximizes conversions. 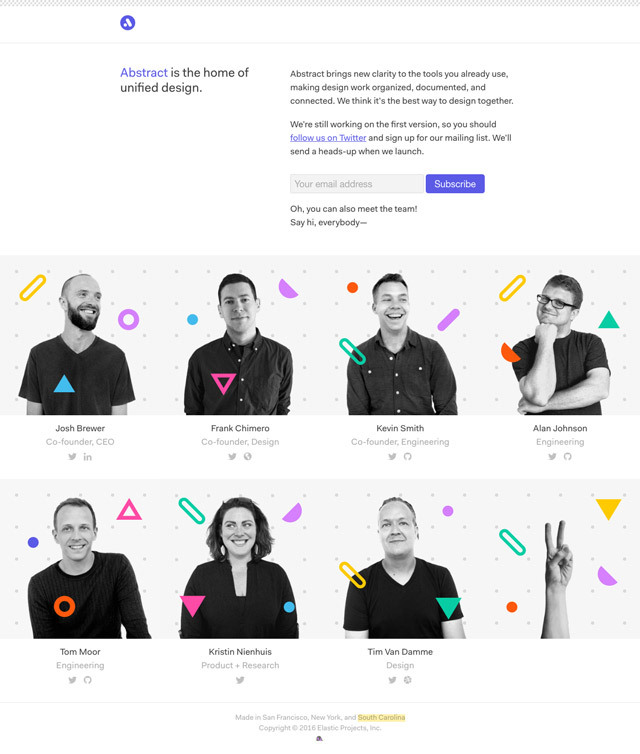 I like that they’ve chosen to highlight the team behind Abstract on their coming soon page. Though I don’t have any specific data on this, adding photos (and social profiles) of the people who are working on the product helps to reduce user uncertainty and increase credibility. If you don’t have much to show in terms of product yet, why not highlight the people who are building it? Poppins is like Uber, but for… babysitters? The section above the fold is great. It features a phone with Poppins on the screen, which immediately establishes what the product is, along with the clear headline. I like that the form is right at the top of the page, and that there are multiple CTAs for the two different target markets (parents and babysitters). The subtle background directional cue leads to a clear description of the app. The page builds social proof by showing how many babysitters are registered in Poppins’ launch city, and highlights the features that are appealing to both parents and babysitters. The form appears again on the bottom of the page, to pull in people who have been convinced through the rest of the page. This landing page is for AdTerminal, which is a data-driven dashboard platform for companies that use ads to market their products. I like the simple above-the-fold section, featuring a screenshot of the platform and a simple one-field form that has an action-oriented CTA. The next section features logos of AdTerminal’s integration, increasing credibility due to the reputation of featured companies like Amazon and eBay. Further down, this coming soon landing page gives a preview of what data on the platform might look like, which helps potential users get a feel for the app itself. The page continues with a slew of other logos from supported ad platforms (and it’s a lot of them), which continues to increase credibiility. Spoil is a quick one-click gift-giving app. This page is interesting because their conversion goal is for visitors to pre-order a Spoil gift, even before launch, which can be a difficult thing to get customers to do. The top section of the page uses social proof (“25 pre-ordered so far”), creates urgency (“14 days left to claim”), and mentions the price, which is often plays a big role in decision-making. I like that the CTA button is huge and bright; this helps to naturally draw page viewers’ attention. I like that this page is a giant, pleasing-to-read how-to. When it comes to spending money, people want to know exactly what’s going to happen to it. Showing potential customers exactly what the Spoil process is like goes a long way towards greatly reducing uncertainty. 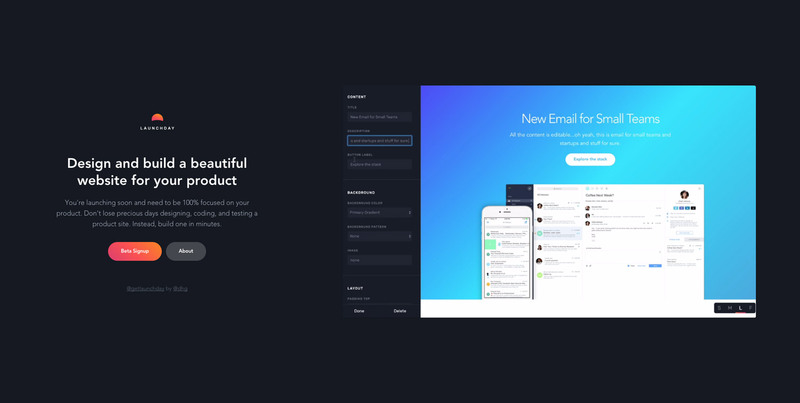 The dividers on this coming soon landing page are giant, full-width CTAs that scroll the visitor to a form at the bottom of the page that simply asks for their email. Elegant! Visionare is a goal-achieving app that connects you with people who have already done the things you want to do. 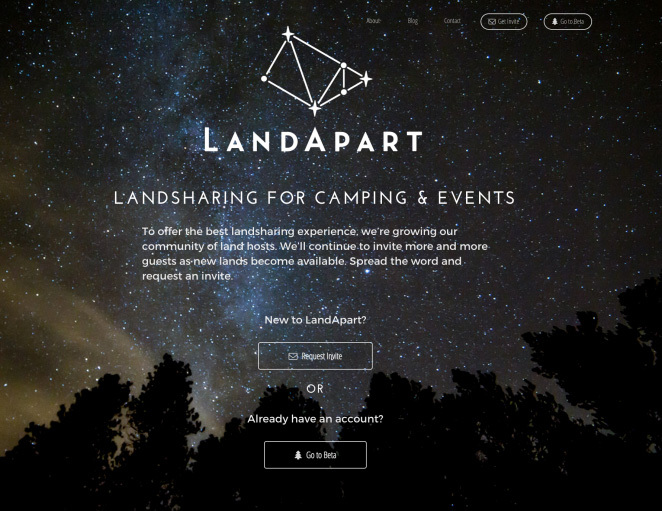 This coming soon landing page is beautiful - it’s tastefully animated and gorgeously designed. 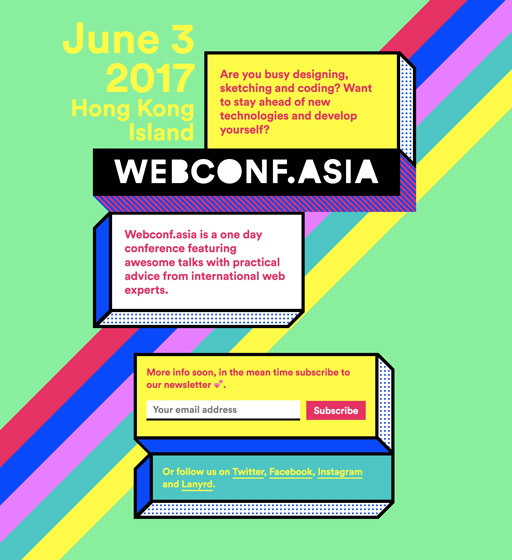 Beyond that, however, the page features a simple, on-brand headline (“Be Visionare”), and a strong directional cue at the bottom of the above-the-fold area. This leads to a dropdown that asks users what they’re looking to achieve, with copy to match. If you can handle it, changing copy dynamically with user intent can drastically increase conversion rates. The “Look Inside” section eases viewer uncertainty by showing potential users what the app looks like on the inside, and the next bullet-pointed features section tells visitors exactly what they can expect from the app. Finally, the bottom-of-page form doesn’t ask for email immediately - instead, it asks you to enter your dream, and then flips to reveal a hidden email field. It’s a clever way to capture lead information, as it asks you something product-related before asking for your email. Once a visitor has already entered some information, they’re more likely to complete your form because they feel like they’ve invested time into it. This is a great way to increase conversion rates on your own coming soon landing page. There you have it, 25 clever coming soon landing page strategies which you can employ on your next pre-launch page today.